A rich formula with natural ingredients, which performs an innovative cleansing action capable of effectively eliminating scalp impurities delicately. It controls hair fall, conditions hair. Balances the PH of the scalp. Provides the hair with more body, makes hair soft & healthy. Enriched with pure essential oils . No synthetic perfumes added . It is an innovative cleanser that sensitively eliminates scalp impurities and restores the natural barrier and rehydrates keratin bres. It controls hair fall and balances the PH of the scalp. Our shampoo will help you increase your hair volume hilst making it softer and healthier . Explore the entire range of Shampoo available on Nykaa. 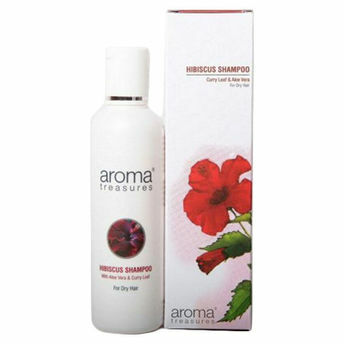 Shop more Aroma Treasures products here.You can browse through the complete world of Aroma Treasures Shampoo .Alternatively, you can also find many more products from the Aroma Treasures Hibiscus Shampoo range.